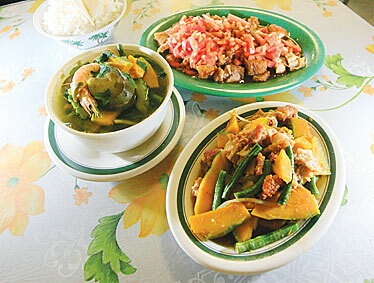 Clockwise, from top right, Thelma's Special, pumpkin pork "guisado," "diningding" and steamed rice set the table at Thelma's Restaurant in Waipahu. Thelma's is a popular Filipino restaurant, known for its Special: lechon (roasted pig) with special sauce, tomatoes and onions. Filipino cuisine is an inventive melding of indigenous ingredients from land and sea, along with the culinary influences of the myriad cultures that have passed through that island nation. "Pancit is from the Chinese noodles," is one example offered by Alfred Marzan, husband of Kusina Maharlika Restaurant owner Adelaida Marzan. Much Filipino cooking reflects the culinary tastes of China. And there are also Spanish, French, Italian, Middle Eastern, Japanese, Thai, Vietnamese and American influences, according to "The Food of the Philippines," by Reynaldo Alejandro. For example, paella (a combination of pork, chicken, seafood, ham, sausages and vegetables) originally was cooked in the fields by Spanish workers, according to Alejandro. And the popular lechon (spit-roasted pig) might reflect a Chinese or even Polynesian influence but is Spanish in name. Bottom line: Filipino cuisine offers a world of choices beyond the standards of adobo and pancit, gisantes and pinakbet. Goat, or "kalderata," for example. Mabuhay Cafe and Restaurant downtown and Kusina Maharlika in Kunia are among the few restaurants with goat on the menu (more on that later), but it's not common. "I do plan to carry various goat dishes soon, such as kaldereta (goat cooked in tomato sauce) or 'kilawen kambing' (blanched goat in vinegar), as many customers have been asking for them," said Cora Europa, owner of Sam & Syd's Cafe in Kalihi. As for the cooking methods, they were not only influenced by culture, but also by climate and environment. Alejandro, in his "The Philippine Cookbook," notes that the basic styles of cooking are sauting, stewing, boiling, braising and or frying, but baking is rare -- probably due to the already warm environment. Vinegar is a common ingredient, he says, because in rural, tropical climates it helps in storing leftovers, and it also seems to improve the taste over time. "Our basic sauces are oyster sauce, shoyu, vinegar and oil," said Larma Campos, daughter of owners Larry and Thelma Torres of Thelma's Restaurant in Waipahu. "It seems that Filipino food takes longer to prepare than American food because of all the vegetables that we use, and it's more tasty." 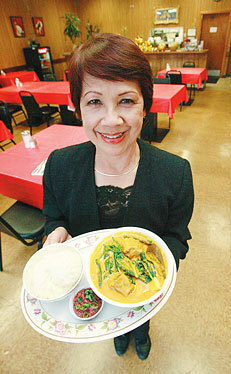 Owner Cora Europa shows a dish of Kare-Kare in her Sam & Syd Restaurant. 2153 N. King St., Kalihi, 847-3630. Open 8 a.m. to 8:30 p.m. weekdays, 9 a.m. to 8:30 p.m. weekends. The dish: Kare-Kare is a delicious blend of long beans, eggplant and cabbage cooked separately, and beef oxtail boiled until tender, mixed with a yummy sauce of peanut butter, water, beef broth and anato powder. Tripe can be added upon request, and rice is served on the side. "This is a dish I serve on special occasions to my friends and family," said 63-year-old owner Cora Europa. "It's more than the usual fried beef or pork. "Our cooks come from other restaurants, so there are a mixture of cooking styles," explained Europa, "but I check the taste." About the restaurant: Europa named her almost 1-year-old eatery after her son Eugene's twin daughters, Samantha and Sydney. Her husband, Mel, a CPA, helps her with the books. Two other Filipino restaurants preceded her at the site: Sari-Sari and Elena's. "I kept some of the same menu items from Sari-Sari," said Europa, "but others I've added or made differently, such as my Lechon Kawali Special (roast pork)." Cora's father came to Hawaii as a sakada (plantation worker) in 1946, and brought Cora from Ilocos Sur in the Philippines when she was 24. "I was a nutritionist and dietitian in the P.I. (Philippine Islands), a cafeteria supervisor for Saga Food Service at East-West Center, and I was the catering manager at the Hau Tree Lanai in the New Otani Kaimana Beach Hotel for 30 years," said Europa, "so when I retired in 2007 it was only natural that I open my own restaurant. "At first it was a bit slow, but now we have many regular customers." Kunia Shopping Center, 94-673 Kupuohi St.; 676-8808. Open 10:30 a.m. to 9:30 p.m. Mondays to Saturdays; 10:30 a.m. to 9 p.m. Sundays. The dish: Kaldereta comes from the word "kaldero," meaning pot (usually heavy metal), according to 61-year-old owner Adelaida Marzan. "Traditionally, a young goat is chosen, and if one's not available, then beef can be used. You cook the goat until tender (two hours of simmering or 30 to 45 minutes in a pressure cooker). Then to take some of the unusual smell and taste out, you soak the goat meat in vinegar and garlic overnight," Marzan said. The goat is marinated with potatoes, onions, tomato sauce, water, sugar, salt, soy sauce, bay leaves, Tabasco sauce and paprika for coloring. Green and red peppers, or pimentos and peas, can be added, then the dish is simmered for about 7 minutes. Chunks of pineapple make it slightly sweet and very tasty. "Because the goat meat can be hard to find, kaldereta would traditionally only be served on special occasions, such as fiesta time," Marzan noted. About the restaurant: Adelaida didn't meet Alfred Marzan until she joined her sister here in Hawaii in 1980, after leaving Pangasinan province (near Luzon). Alfred, a Navy draftsman, was waiting tables part time at the NCO club at Pearl Harbor. A friend introduced them and they married soon after. Their daughter, 25, goes to Leeward Community College, and their son, 23, lives in Las Vegas. "Kusina Maharlika means 'royal kitchen,'" said Adelaida, whose full-time job is as a school-home assistant with public schools. "I thought since I live in Royal Kunia, that that would be a good name for my restaurant (which opened in 2005). "When I was growing up, my mom would always cook good Filipino food, and my aunties and grandma would always tell me to come watch them cook, so I decided to open my own restaurant. "And I know that Filipinos, whether local or native, crave Filipino food." That's true for Paul Paule, 38, a Pearl Harbor computer cryptologist, who grew up around Filipino cuisine. "I've been coming here about once a week for the past year, and I'm amazed at how good the food is. And I've only gotten through about half the menu." 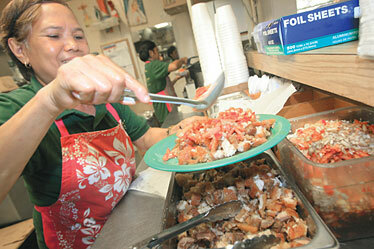 Chef Aida Alviar adds tomatoes and onions to a Thelma's Special plate at Thelma's Restaurant in Waipahu. Westgate Center, 94-366 Pupupani St., Waipahu; 677-0443. Open 5:30 a.m. to 9 p.m. daily. The dish: Pork Pumpkin Guisado ("guisado" means to saut or mix) is a slightly sweet combination of Filipino "carabasa" (green pumpkin), roast pork, long beans, round onions, oyster sauce and oil. Rice is served on the side. "We steam the ingredients until the carabasa is soft," explained "Auntie" Corazon Nanzon, co-owner Thelma Torres' older sister. "You have to do it just right because you don't want the carabasa too hard or too mushy." "This dish depends on the availability of the carabasa," said second daughter Larma Campos, 30. "It's locally grown but probably originally from the Philippines, because I've never seen it in any other cooking. "It can be eaten every day, and our dad would make it at home for us when we were growing up. I like the sweetness of the pumpkin; it goes well with the pork." About the restaurant: Don't let the purple hair highlights or the tongue jewelry fool you; Larma Campos acts as business manager for her parents' restaurant, minus the title. The Sacred Hearts Academy and Honolulu Business College grad has three sisters: Lorena, 31 (who lives in Las Vegas), Lei Anne, 25, and Liberty, 24 (notice how all the names begin with L? -- that's from Larma's dad, Larry). "My sisters help out on the weekends with the cooking." Larry Torres opened the restaurant, named after his wife, in 1991. "They were elementary school sweethearts back in Pangasinan (west-central Philippines)," recounted Larma. "My dad came here with his family and attended Waipahu High School, then went back (to the Philippines) to marry my mom and bring her back here. "My dad loves to cook and was a waiter at the Royal Hawaiian Hotel for about 21 years, and my mom was a waitress and fry cook at another Filipino restaurant for about 20 years, so when my mom got the idea to open their own restaurant, it just made sense." The first two years were difficult, with the entire family pitching in, but now they have about 25 full- and part-time employees. "I do plan to continue my parents' business," said Larma. "We're even thinking of expanding, possibly in Kalihi or even in Las Vegas." 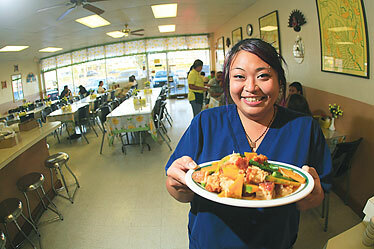 Larma Campos holds a platter of pumpkin pork guisado at Thelma's Restaurant in Waipahu.